Austrian architect; born in Prossnitz, Moravia, March 29, 1841. After graduating from the polytechnic high school of Vienna, he entered the Vienna academy of fine arts, where he studied under the architects Van der Nüll, Storck, Roesner, and Friedrich von Schmidt. For the part he had taken in the building of the new Vienna town hall, he received from the emperor the golden cross of merit with the crown, and from the common council the freedom of the city; and his bust was placed upon the keystone of the entrance to the town hall. After acquiring a competence he devoted himself chiefly to designing synagogues and tombs. He planned the synagogues in the eighth and nineteenth districts in Vienna, also those in Budweis, Krems, Pilgram, etc. ; while others (e.g., those in Nikolsburg and Lundenburg) were rebuilt under his direction. The tombs of Wilhelm, Ritter von Gutmann, Salomon Sulzer, Adolf Jellinek, Adolf Fischhof, and others, at the Central-Friedhof, Vienna, are from his designs. 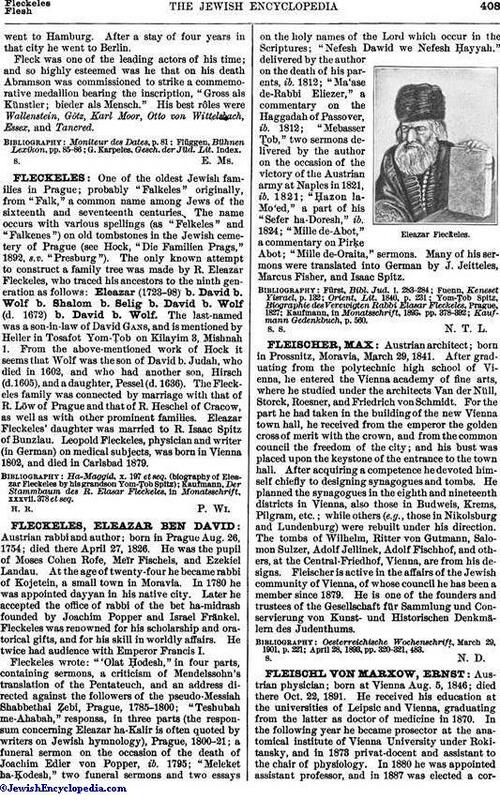 Fleischer is active in the affairs of the Jewish community of Vienna, of whose council he has been a member since 1879. He is one of the founders and trustees of the Gesellschaft für Sammlung und Conservierung von Kunst- und Historischen Denkmälern des Judenthums. April 28, 1893, pp. 320-321, 483.